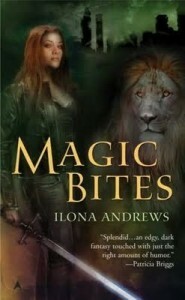 I pretty much became a squealing fan of Ilona Andrews after I finished the first four books of their Kate Daniels series. Who wouldn’t? By the time I finished the fourth book, there was a long lull before the fifth book comes out but I wanted more Ilona Andrews. Good thing they also had another series going set in an entirely different world and I won the first two books of that series in a giveaway, so I had more Ilona Andrews in stock. Of course, I took my own sweet time before reading it…but that’s really expected of me. Rose Drayton lives on the Edge, the land between the magical Weird and the normal Broken. She lives and is fiercely protective with her two younger brothers, necromancer Georgie and changeling Jack. Rose is somewhat of a social pariah among the Edge because of her unusual power: the ability to flash white, something that no Edger has ever done. This has made her a target for bluebloods from the Weird, if not as a wife to produce white-flashing powerful babies, but for slave merchants to sell to the highest bid. It’s no surprise that Rose is closed off to anyone, and it doesn’t help that her family is also very poor that she can’t afford many of the luxuries in life, including motor home repair. Rose works in the Broken everyday to make ends meet, so she’s very determined to keep her routine and live her life inconspicuously. Then comes Declan Camarine, an Earl from the Weird, who is intent at having her. Rose is not about to let anyone get her and leave her brothers behind. When weird things start showing up in the Edge and threatens everyone she knows, she had to team up with Declan to find a way to destroy it and keep the Edge safe. 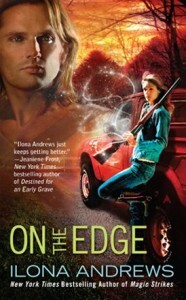 On the Edge is very different from the Kate Daniels series. It’s more romance than urban fantasy, but the world is grittier and somewhat more primitive than what Kate lives in. By primitive, I don’t mean it’s less powerful, but just different. Most of the magic discussed in this book was elemental, back to the basics, unlike in Kate where there is more of the weird and seemingly more complex magic all around. Not that I know much, of course, but this one had a different feel from the other, which I kind of had to get used to first before I fully immersed. But as always, the world building in this book is flawless. That’s one of the many things I admire with Ilona Andrews novels — the world seemed so real with all its quirks and intricate rules and details. Even if everything is highly unbelievable, I couldn’t help but accept that what was written in the book was real, and that the world is divided in three. This alone could make the book a pleasure to read already, and I think that’s really want I’m looking for in fantasy novels: good world building. I know I can’t write a good fantasy world (not yet, anyway), so I’ll stick to reading them instead. And like with Kate, Rose is also as fierce as her. I liked Rose because of her strong attachment to her family. Sometimes she gets too attached, but as the story went on, she grew to understand that she can’t baby her brothers all the time. Rose is strong and admirable, and it makes one understand why Declan would like her. I like Declan too, but I did get kind of annoyed at how many times he was described as “perfect” in the book. Too many mentions of his well-defined muscles, glittery eyes and skin is a bit too much. My favorite characters in the book, however, are Jack and Georgie — gotta love those two boys. They captured my heart from the start. I also liked Declan’s family, but too bad they didn’t have much exposure time. Since this is more of a romance novel, there was more focus on the relationship than in the action in the book, so the climax part was kind of expected. I wasn’t as invested in Rose and Declan’s relationship as I was in Kate and Curran, but the latter had more build up than this one, so I guess that’s a normal reaction. I guess the key here is to really stop comparing from the other series because they fall on sort of different sub-genres. 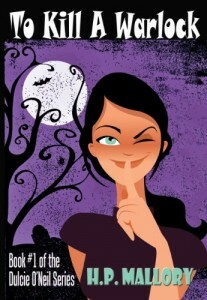 I’m still fairly new to the urban fantasy genre, and I am still avoiding paranormal romance (maybe I should make a post about that sometime) so when I received a review request from HP Mallory for her books, I was kind of hesitant to accept it. But I’m not really one to say no to free books, so I thought, why not? I finally found the time to read To Kill a Warlock when we started moving a week ago. I figured after reading about zombies, I need to take a break from the gore so this should be a perfect read. And since we were moving, all my books were packed, so all the reading I could do was in my Kindle. So Dulcie is a fairy and one of the best Regulators from the Association of Netherworld Creatures (ANC) in California. As a Regulator, she monitors the activities of the different paranormal creatures in her area and makes sure they act in accordance to the laws. But after her Regulator job is finished, Dulcie hides in her house and works on her novel, which she hoped to published so she can be rid of her Regulator job. Her more or less regular Regulator (ha, sorry, I can’t resist!) job is disturbed when a warlock dies and she was the last one who saw him. The story follows Dulcie as she tries to figure out who killed the warlock, work on her novel and figure out her relationships with the different men in her life which included a vampire, a demon, an elf and a Loki. To Kill a Warlock is generally a fun read, with a spunky heroine who’s had a broken heart and dreams of being a published writer. The story is pretty tight, with a good — although not really unique — concept about a group that regulates paranormal creatures among humans, and of course, lots of romance for Dulcie. That being said, however…I don’t think To Kill a Warlock really worked for me. :( I hate it when this happens, especially since it seemed like many readers liked the book and the characters (and that I got this book for review). I did not hate any of them, really, but they just failed to make an big impression on me that I just didn’t care about them as much as I normally would. As the story got to the climax, I found myself just flipping to the next pages, eager to finish because I was getting tired of how they seemed to be going in circles. When the major action has finished and everything has settled, I thought it was over, but it wasn’t…and it led me wondering, “What else could happen after all that?” I didn’t feel very satisfied at the ending because I felt like it was a bit of a cop out — everyone sort of at peace with each other, with Dulcie having three guys going after her. In the end I was just confused. It’s not that it’s a bad book. I have to give some merit to the author because I enjoyed myself in some parts of the book, but as a whole, I was underwhelmed. I think I can put the blame on Ilona Andrews and their Kate Daniels series with how I viewed To Kill a Warlock. 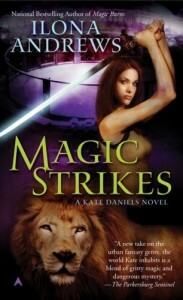 The Kate Daniels series is my first time to read adult urban fantasy and I loved every bit of it, so I got kind of spoiled with their world building and character development in those books. So much so that my expectations were a bit too high when I read To Kill a Warlock. Perhaps if I read this first before any of the Kate Daniels books, I’d think otherwise. → I was pretty much underwhelmed with To Kill a Warlock. 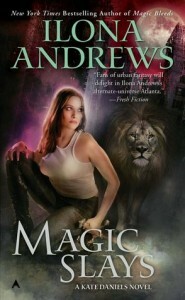 It’s a good urban fantasy novel, but it just didn’t work so much for me.